MJK is a figure model company based in Korea. The kit came in a very sturdy box with tuck in flaps to hold it shut. The box art shows the figure made up and painted. He is wearing a red jacket, white shirt, red hat with yellow feather adornment and a blue waist sash. Very well painted. 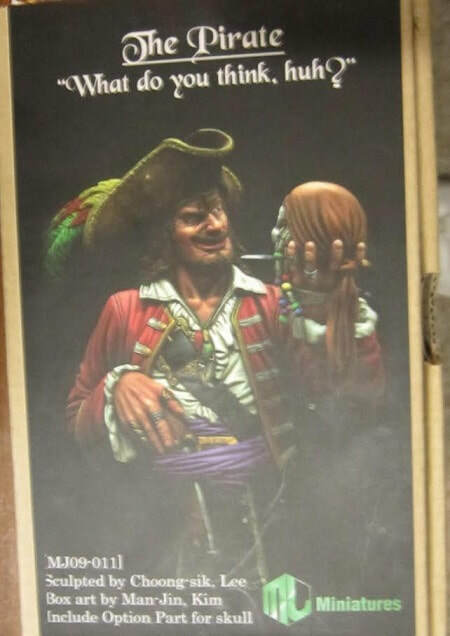 The title on the box art says "The Pirate - What do you think, huh?". It says that he was sculpted by Choong-sik Lee. The box art is by Man-Jin Kim and it contains an optional part for the skull. I assume that optional part is the Bicorne hat. The scale of the kit is 90 mm. 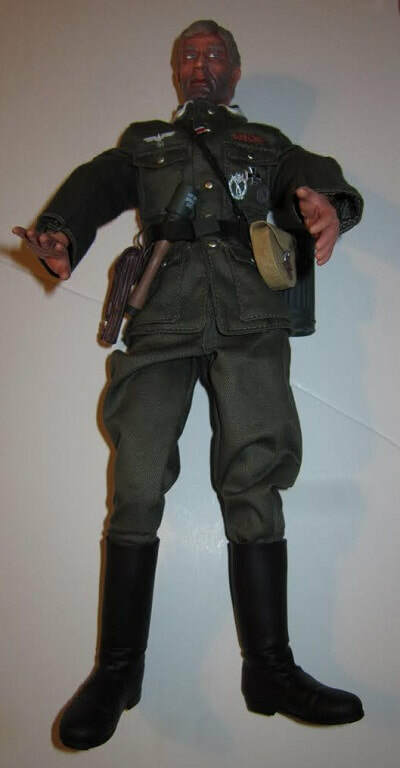 ​It contains 12 light gray resin parts: a bust and base, a Bicorne (2 cornered hat) and Tricorne (3 cornered hat) hat with feather adornments for both, a right and left arm, a right hand holding a pistol tucked into a waist sash, and his left hand is holding a skull with a patch over its one eye and a dagger. The detail is superb and only a few very small pour lugs need to be removed to get the parts ready for assembly. Parts are packaged in 2 zip-locked cello bags that are further packaged into 2 bubble-pack envelopes. Very thorough packaging! High Calibre Miniatures is the distributor for this kit. ​They sent this kit in a very sturdy tuck-flap box. I want to sincerely thank them for this review sample.